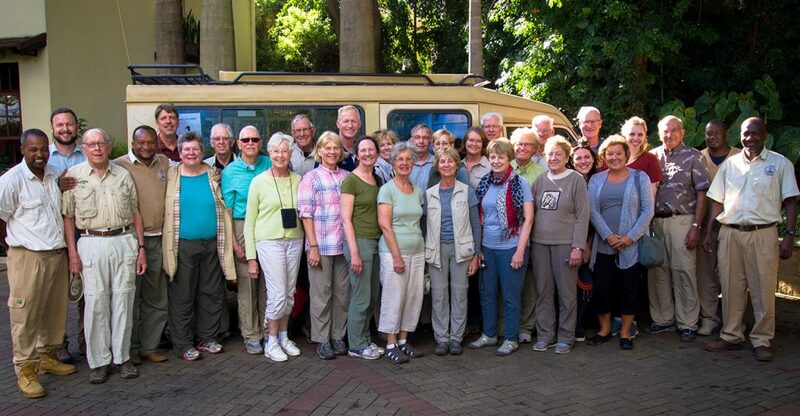 Tim Laman ’83 takes a photo alongside guests on the recent travel program trip to Tanzania. The jubilant “whoop” on the plains of the Serengeti isn’t the call of the African black-bellied bustard. It’s award-winning wildlife photojournalist and field biologist Dr. Tim Laman ’83 celebrating the composition of a special photo. 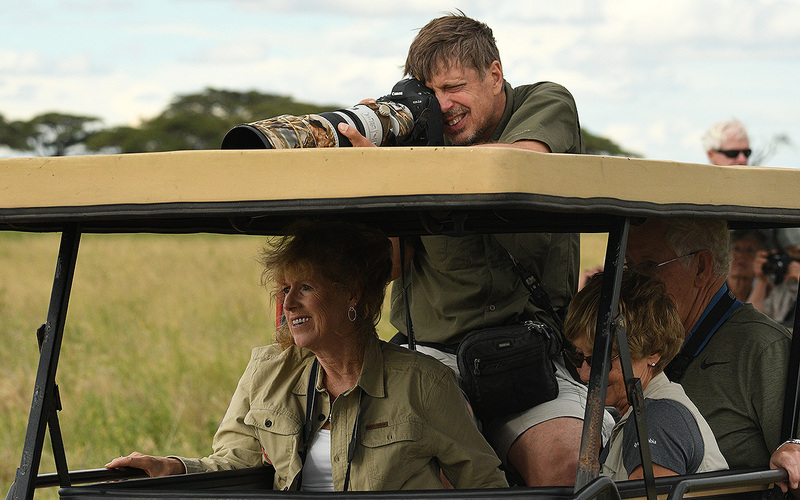 As he reviews the images on the back of his camera, he beams with satisfaction, and a brief nod confirms he’s enjoying his time photographing the national parks of northern Tanzania. 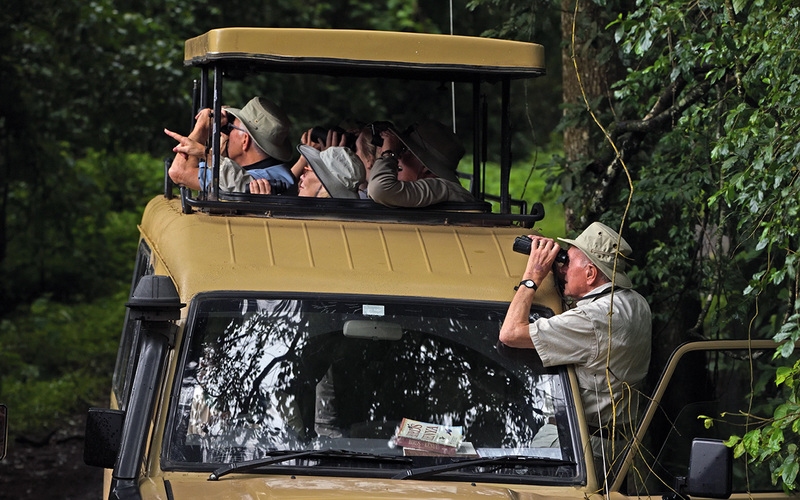 Professor emeritus Eldon Greij leads a safari vehicle of interested birders. 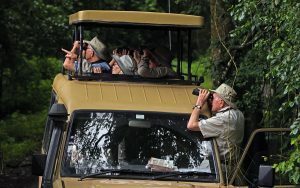 In a nearby Toyota Land Cruiser, Dr. Eldon Greij, professor emeritus of biology and founder of the magazine Birder’s World, focuses his binoculars on a pair of raptors, while calling out identifying characteristics. The local driver/guide joins in. When necessary, they consult, “The Birds of East Africa,” a field guide laying on the dashboard. The energy and enthusiasm is palpable as they confirm another species to add to the checklist that evening. The former faculty and student research team takes a break in Arusha National Park as colleagues and trip co-leaders. An African safari has been my dream trip since I was a Hope sophomore and hoping to photograph wildlife found in that part of the world. When I heard that Eldon Greij and Tim Laman were co-leading a tour with the Hope College Alumni Association, I was the first to pay my deposit. Based on their expertise, I was confident it would be an exceptional experience. Eldon taught in the Hope College Biology Department for 26 years, specializing in ornithology and ecology. He founded Birder’s World in 1988 and edited the magazine for 11 years. 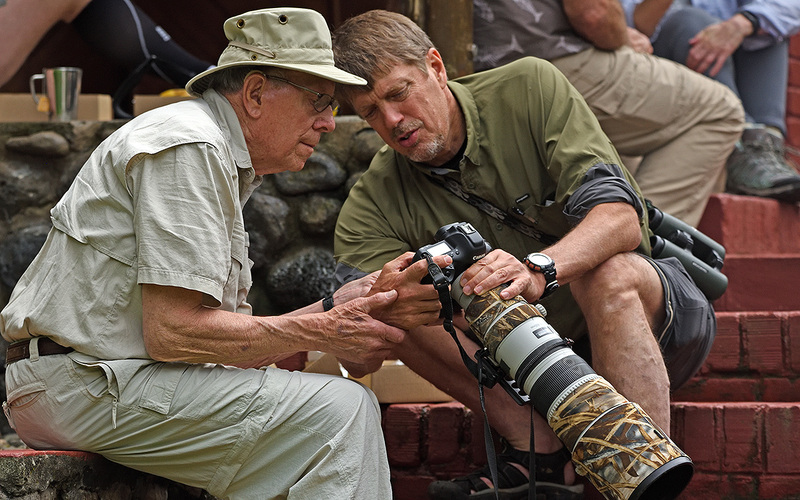 During that time he led birding tours to the Amazon and Africa for readers of the magazine. He also led Hope student May terms to Peru and Tanzania. Tim has excelled as an international wildlife photographer and videographer. A contributing photographer for National Geographic, he was named Wildlife Photographer of the Year in 2016 by the world-renowned British institution, the Natural History Museum and BBC Wildlife Magazine. More than 50,000 entries from 95 countries were submitted for this prestigious competition. He has recently been a videographer for nature documentaries produced by the BBC. For this Hope College tour, Eldon worked with his connections at Roy Safaris in Arusha to develop an itinerary that included a balance of national park game drives and cultural experiences. Highlights included Arusha National Park, making coffee at Tengeru Village, Tarangire National Park, an afternoon learning about an Iraqw tribe, Lake Manyara National Park, Serengeti National Park, NDUTU, time with children at the Nainokanoka Primary School, Ngorongoro Conservation Area and Crater, and a visit to a Maasai Village. Twenty-eight alumni and friends from across the United States signed up for this adventure. Our ages ranged from 23 to 83. The reasons they shared for taking this journey were as varied as our ages. Some wanted to interact with people from other cultures. Some were drawn by the allure of so many animals. Many were eager to add new species of birds to their life list. Some came for the opportunity to improve their photography skills under the mentorship of a National Geographic photographer. Some sought the thrill of the adventure of traveling to another part of the world. We all had a common desire to see and learn as much as we could during this unique opportunity. 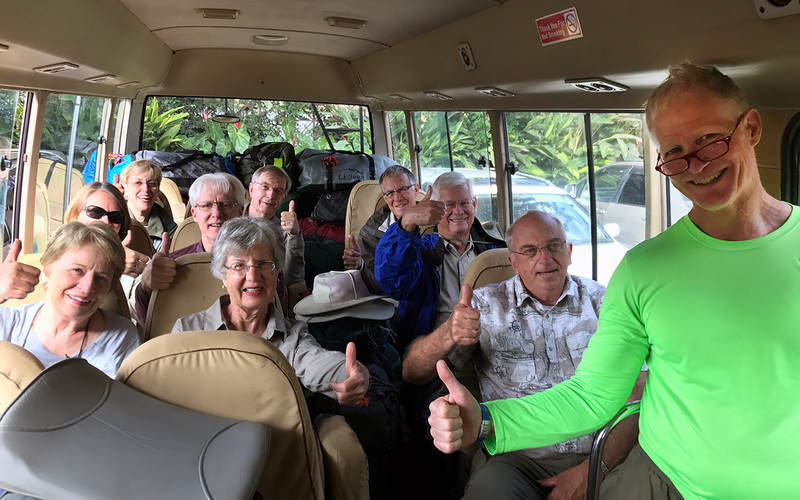 The full group and guides celebrate a successful safari at the African Tulip in Arusha. Our guides, Thomas, Nico, Emmanuel and Salvatory, take a break for a photo before lunch on the edge of the Serengeti. We had four amazing local safari guides who led the way and answered our constant questions. As we traveled the bumpy roads, they proudly taught us about their beautiful country and shared their stories. Thomas, Nico, Emmanuel, and Salvatory, knew the national parks well and easily spotted a wide variety of mammals and birds. They loved their jobs and it showed. It was just as refreshing to see Eldon and Tim enjoying their vocation with so much enthusiasm. They freely shared their knowledge. Tim helped us develop our photography skills during the day and shared his photos at night as another way for us to learn. I was eager to absorb Tim’s photography tips, but I was equally impressed by his natural history knowledge of Africa. With stunning landscapes and assorted wildlife around almost every corner, photo opportunities were plentiful. The click of camera shutters in our vehicles seemed to be never-ending, and we were all a little giddy when reviewing our photos. I know my photography improved with each day’s shoot. This agama lizard earned the nickname of the Hope College lizard for his orange and blue spirit. We saw a plethora of animals — many I had never heard of before, including the black-faced vervet, large spotted genet, rock hyrax, klipspringer, eland, Coke’s hartebeest and topi. Within a 24-hour period, we were elated to see Africa’s big five: elephant, black rhinoceros, cape buffalo, lion and leopard. We even glimpsed the orange-and-blue agama lizard which we ceremoniously dubbed the Hope College lizard. 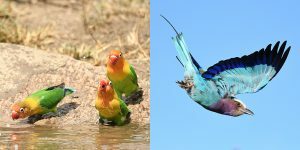 The bird list also seemed to be endless, and I think most of us became enamored with the lilac-breasted roller and the Fischer’s lovebird. Ficher’s lovebirds and a lilac-breasted roller. More than a month after returning home from our travels, I’m just as excited about this safari now as I was during the trip. I am thrilled that I became a better photographer during the trip, especially because these images will help me remember such a wonderful experience in vivid detail. Thanks to Eldon, Tim, and our guides, each day on the trip was educational and inspirational. Happy travelers at the end of their adventure. I’m thankful for the opportunity to have traveled with other Hope alumni and friends, and I’m grateful for the leadership we had. The Alumni Office staff did an amazing job of coordinating all the details before, during, and after the tour. We could fully enjoy the trip because we didn’t have to worry about all of the logistics. A special thanks to Kasey Petro and Scott Travis for making it all run so smoothly. As we set off in early May I know there were a lot of expectations to fulfill for this group. Personally, my expectations were exceeded on the first day and every day! Check out video highlights and photos taken by various members of the group in the galleries posted below. You can also learn more about Tim Laman ’83 and see a collection of his work from this trip at magazine.hope.edu. If you are interested in joining the mailing list for the travel program, please email alumni@hope.edu.